San Francisco is more than 5,000 miles from London. Nevertheless, the level of excitement around here surrounding the Royal Wedding has been palpable of late. The local press is advising Bay Area residents about how they can feel connected to Friday's events at Westminster Abbey with the help of Facebook, YouTube and Twitter. The British consulate is hosting a ceremonial ball. Pubs are offering free beer and champagne to customers whose names are William and Kate. But anyone looking for some critical distance on primetime TV’s endless pontification regarding the bride’s wedding gown might do well to attend “The Lily’s Revenge,” a new theatrical production currently playing at The Magic Theatre through May 22. Conceived, written by and starring the New York-based drag cabaret artist and playwright Taylor Mac, the five-act show is like a wedding reception on quaaludes. A carnivalesque cornucopia of sparkly costumes, strewn rose petals and energetic song, “The Lily’s Revenge” makes theatergoers feel as excited as a bridesmaid who’s unexpectedly caught the lucky bouquet. At the same time, Mac’s call for equal marital rights — through the telling of a narrative about a naïve, young lily whose greatest desire is to shed his petals and become a bridegroom to a beautiful bride — is clear. His overbearing theatrical extravaganza repulses us, undercutting the institution of marriage altogether. Running about the same length as the average wedding party at five hours (don’t worry – it feels somewhat shorter) and employing the services of 31 cast members and six directors, “The Lily’s Revenge” is more like an over-the-top celebration than a traditional play. This Bridezilla-like undertaking is a formidable achievement for the modestly sized Magic Theatre, proving artistic director Loretta Greco’s fearlessness and sense of fun. These qualities are most obvious in the stunning visual appearance of the production, which makes a drag queen’s boudoir look like a nunnery. Festooned with antique clocks and floral wallpapers, Andrew Boyce’s set design resembles an old lady’s living room or a trendy Valencia Street boutique, depending on your point of view. The lurid makeup design of Monique Jenkinson, best known as biologically female drag performer “Fauxnique,” favors sky blue eye shadow and glittery lips. Lindsay W. Davis’s gorgeous costumes are equally arresting. 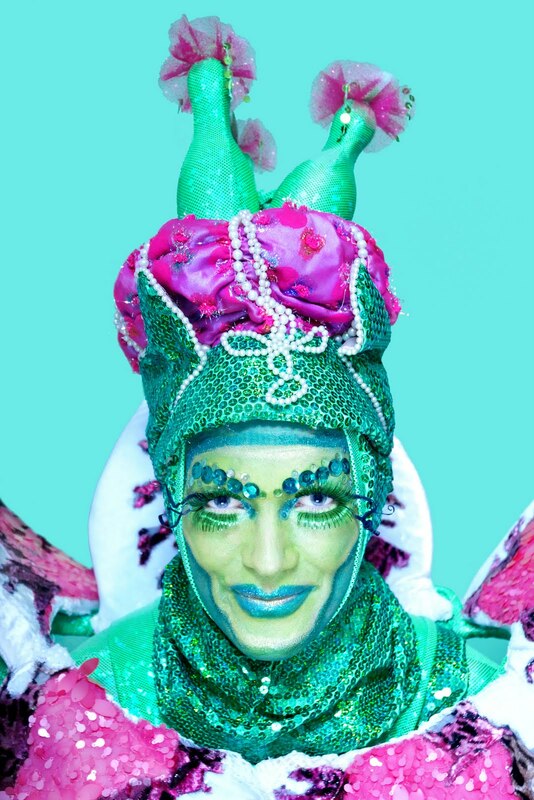 Trussed up for most of the show in a baggy, sequined pea-green onesie and turbaned headdress encircled in detachable petals with fluffy layers of pink tulle anchoring his feet, Mac makes a formidable flower. The splendidly ridiculous get-up perfectly offsets Mac’s melodious voice and graceful movements. Davis’s other floral creations, such as a crimson feather-wigged rose and several shiny, yellow silk gown-wearing daisies, are so ravishing to look at that they threaten to upstage the performers inside them. The play benefits greatly from the production’s seamless and imaginative engagement with the audience. In the second and most memorable section of the drama, the petaled protagonist teams up with a bunch of renegade, iambic verse-speaking organic flowers on a quest to destroy the factory farms that manufacture genetically-modified white roses for wedding bouquets in Guatemala. At one point, the actors hand out large green leaf-shaped papers with words on them, and the audience, finding themselves co-opted into the scene as a field of forget-me-nots, dutifully chant wholesome lines evoking the floral community’s gung-ho spirit. But even the most wondrous and magical of lands can become tiring after a few hours. The decibel levels remain ear-searingly high throughout the evening. The actors scream a lot (especially in the third part) and the live band doesn’t hold back. With the action being so relentlessly full-on, one yearns for a quiet corner to collect one’s thoughts in between acts, instead of rushing from one carnie hipster side-show to the next. Alas, there is no place in Fort Mason Building D to hide. Even the restrooms serve as sites for intermission performances. Yet drag cabaret theater wouldn’t be drag cabaret theater without a large measure of lily gilding. While the overbearing nature of “The Lily’s Revenge” can be off-putting, it also helps to underpin the playwright’s central, Proposition 8-driven point about marriage as being a nostalgia-driven institution hopelessly in need of an overhaul. Even with a rather bland finale, with Mac moving from crazed periennial to prototypical bridegroom, any particle of interest that one might have had in the British royal nuptials before experiencing “The Lily’s Revenge,” will have completely evaporated in a haze of genetically modified flower petals by the time the performance is through.